There is a new natural sweetener on the loose in Europe. More than ever snack foods like muesli bars and health drinks found in health food shops are sweetened up with agave syrup. Now everything from blueberry daiquiris to chai maté tea and porridge are being made with the natural alternative to processed sugar cane (also see our raw chocolate recipe blog which uses agave). Now, if you travel to Mexico you will find that agave is used to tantalize your taste buds in a whole other way beyond the dessert variety. 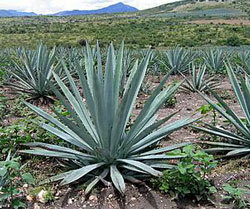 Mezcal, the main ingredient in Tequila is made from the green aloe vera look-a-like agave plant. It was in the 16th century that mescal originated in Mexico. Then it was called ´Vino Mezcal´, which means ´drink of the gods´. Greatly revered by the ancient ancestors of Mexico; the maguey plant, which is a type of agave, was seen as an extension of the goddess Mayahuel. The historical significance as well as the fact that it is widely grown throughout Mexico earned the country the prestigious ‘Designation of Origin’ award, a source of great pride for the country. You can find some of the biggest Agave plants in the Mexican state of Zacatecas. Here lies one of the largest producers of Mezcal – ‘Real de Jalpa’- who create, through traditional natural processes, the best Mezcal in Mexico. One place you´ll find a lot of Agave used is at the lively Mexican festivals. One of the biggest is the Day of the Dead (El Día de los Muertos or All Souls' Day) celebrations. This happens at the same time every year around Halloween and with a similar feel of skeleton, ghost and witchy decorations. This day is to remember and celebrate the lives of those who have passed on. Sweet treats sweetened with agave fill the streets with a sugary aroma, as does the agave based Tequila. Other than tasty treats you can also use the agave plant to do as the natives do and make nails, pens and string to sew with. The leaf has medicinal properties; when taken orally as a tea it is a useful diuretic and can treat constipation. The root can be used to treat arthritic joints. Be warned however, the juice from some species of agave can cause contact dermatitis including reddening and blistering so don´t be going and mixing it with any of your organic face creams!